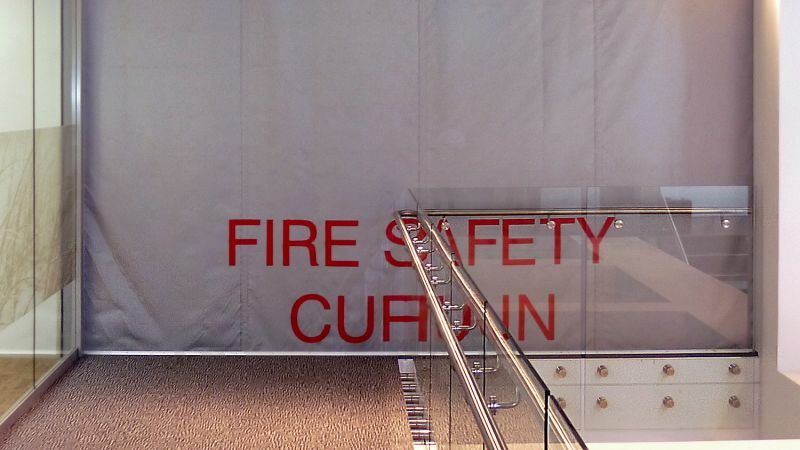 A fire curtain is used where, if there is a fire, it is necessary to create a temporary barrier within an opening which seals off the area on fire. The curtain descends and prevents any fire and smoke from spreading from one area to another. 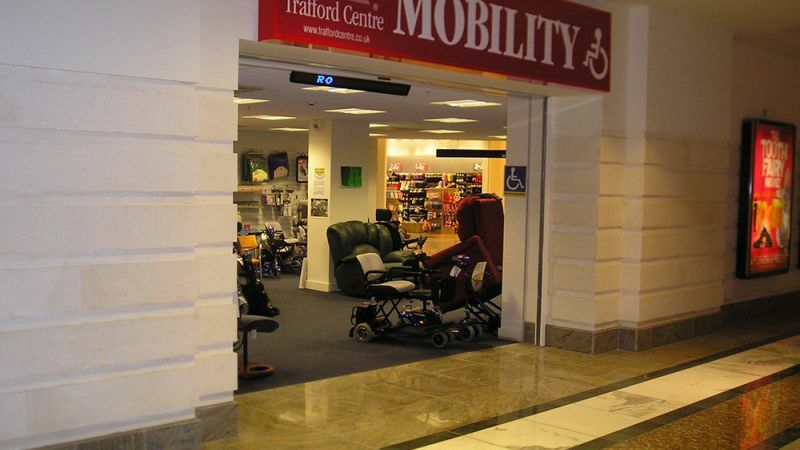 It also allows people access to protected escape routes without any loss of fire resistance. 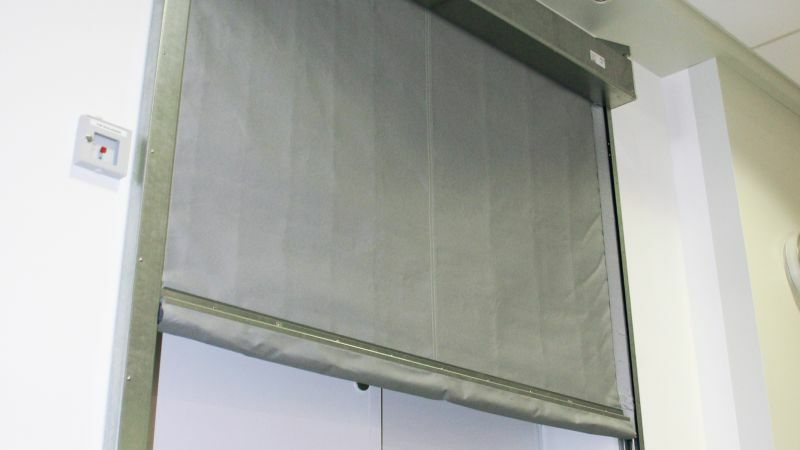 A FM-1 fire curtain comprises a flexible fire-resistant fabric which is wound around a circular tube. Upon receiving a signal from the fire alarm system or on loss of power the curtain automatically unwinds to its operational position. 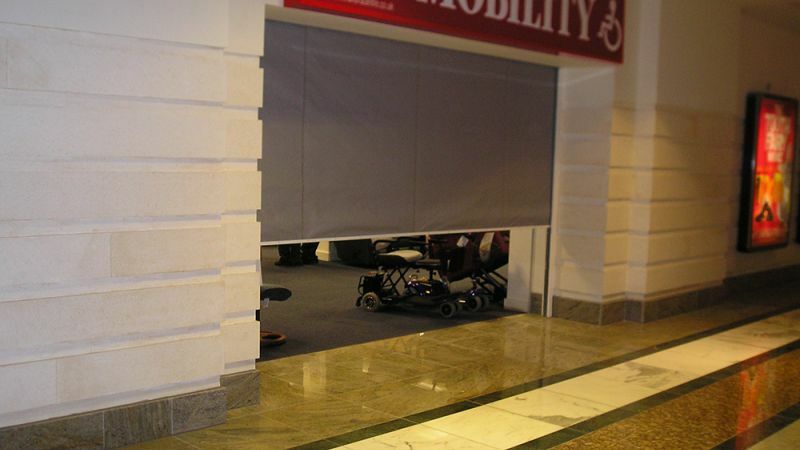 FM-1 fire curtains have been tested as fire barriers in accordance with EN 1634-1, providing protection for a defined period and at a defined maximum temperature. 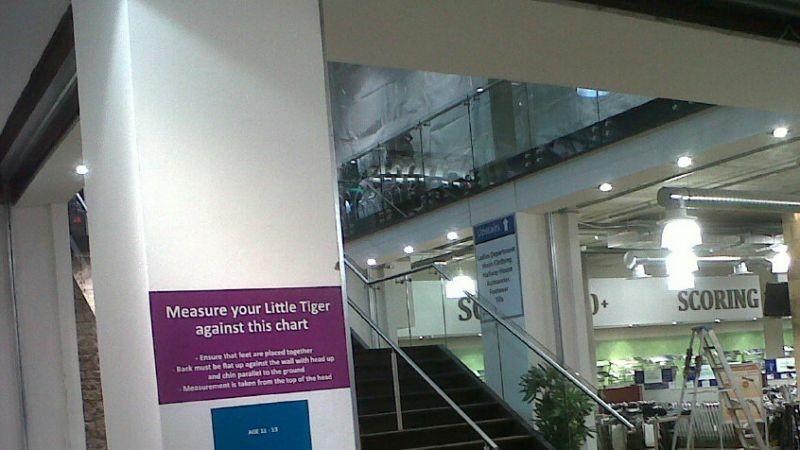 High and certified performance - FM-1 fire curtains have been tested as fire barriers for either 60, 120 or 180 minutes resistance, in accordance with EN 1634-1. They have E60-C, E120-C and E180-C ratings in accordance with EN 13501-2, thereby achieving an integrity rating for either 60, 120 or 180 minutes. A FM-1 fire curtain has achieved a successful a continuous life cycle test (10,000 cycles) in accordance with DIN 4102-18. The E120-C and E180-C versions also have class EW 30 in accordance with EN 13501-2, which demonstrates that the fabric re-radiates only a limited amount of heat. 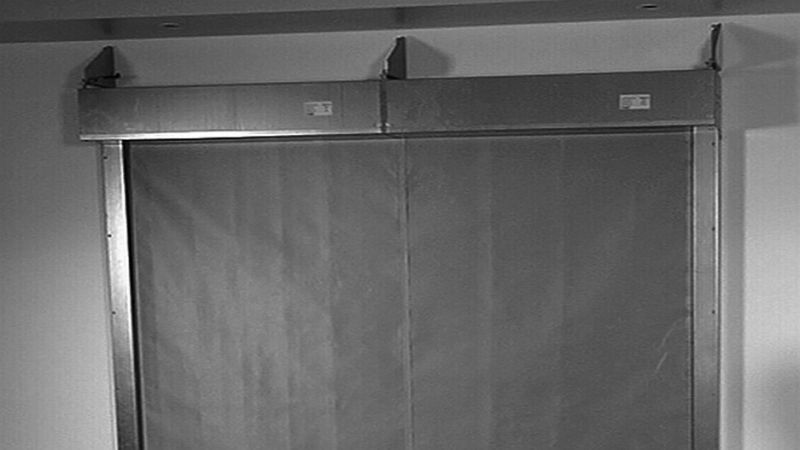 No power needed to operate it – A FM-1 fire curtain unwinds to its operational position under the influence of gravity in a “gravity fail-safe” manner without the need for power. 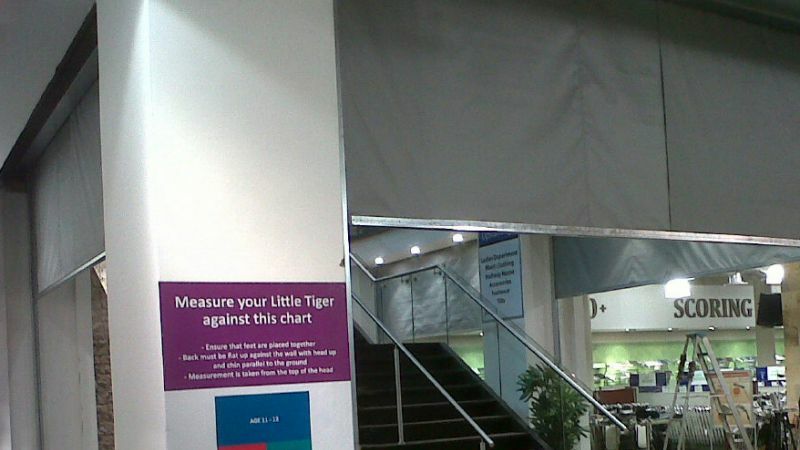 Compact and low in weight – A FM-1 fire curtain is lightweight and compact, which enables it to be installed easily in a place with space constraints such as a false ceiling. 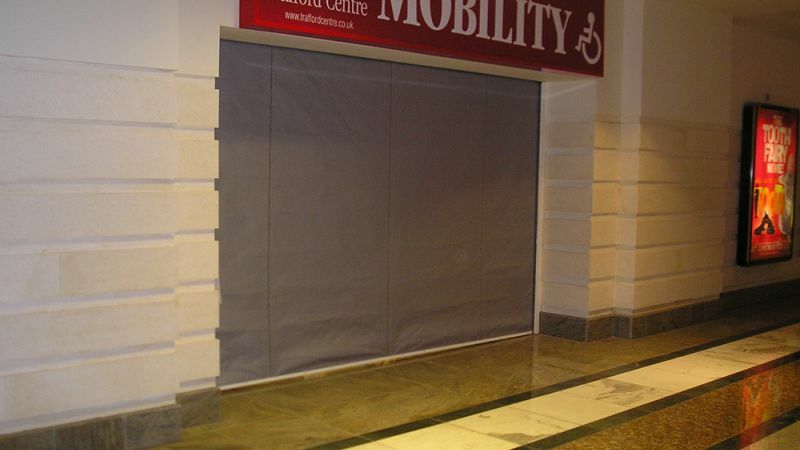 Such a roller fire curtain is much more unobtrusive than a roller shutter with a comparable performance. 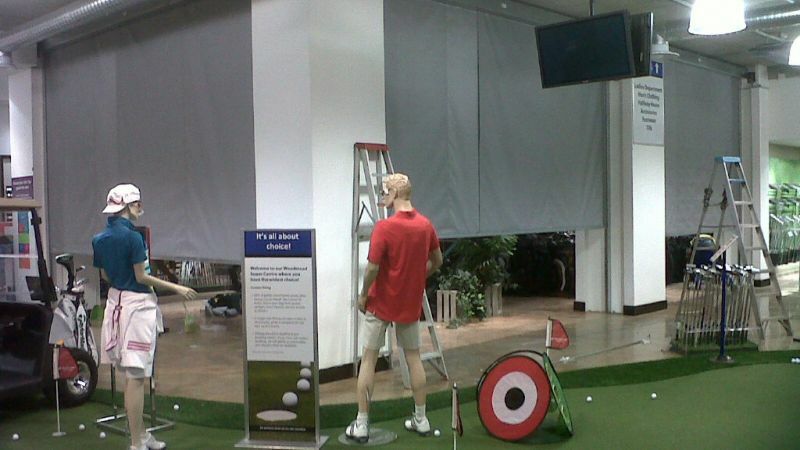 A wide range of options – A FM-1 fire curtain can easily be adapted to the physical constraints of the building. All system components – headboxes, fabric, bottom bars, drive systems – can be customised to your needs. See our options tab for further information. Easy to install and maintain - A FM-1 fire curtain is delivered in modular form and as such is easy to install. The bottom of the headbox is closed off with a panel which also allows the entire length of the system to be accessed for servicing. Virtually invisible when rolled up –There are no visible fixings either on the underside of the headbox or on the bottom bars. The headbox, the bottom bar and the side guides can be powder-coated to a RAL colour to blend in with the building. 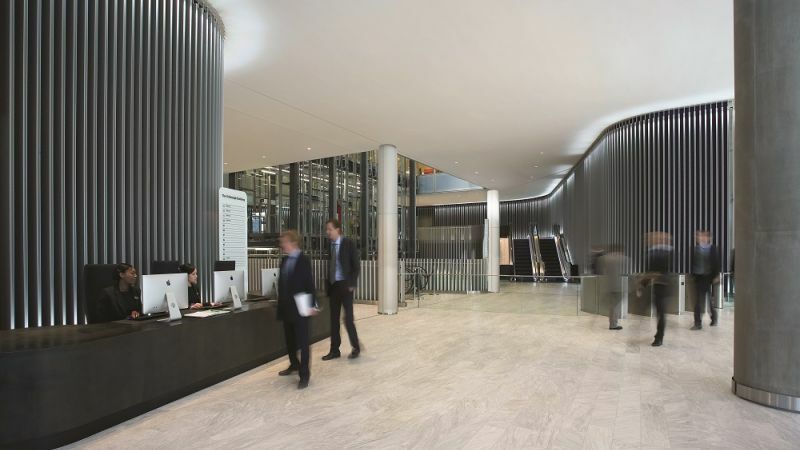 Can accommodate thermal movement – All major components are fitted with expansion joints, which enables the curtain to function at high temperatures. Robust manufacture – FM-1 fire curtains are manufactured under the ISO 9001 quality standard by Colt. A FM-1 fire curtain is available either as single unit, or as either a double horizontal or a double vertical unit for continuous runs, where fabric is overlapped to form a continuous barrier. Overall curtain lengths for single units are available from 1000 mm to 5000mm, and drops are available from 500 mm to 6000mm. Double vertical and double horizontal units are unlimited in length and drops are available from 500 mm to 6000mm provided that curtains overlap. E 60 heat-stabilised fabric achieving 60 minutes fire integrity. E 120 heat-stabilised fabric with a stainless steel inlay achieving 120 minutes fire integrity, with a EW 30 reduced radiation class to EN 1363-2, limiting the radiation of heat for a period of 30 minutes to prevent a fire being transferred to an adjacent area by radiation. E 180 heat-stabilised fabric with a stainless steel inlay, achieving 180 minutes fire integrity and 30 minutes limitation of the radiation of heat, as E 120 above. There are three bottom bar options. All are virtually invisible when the curtain is rolled up. ID “industrial” type designed for industrial applications, comprising a fabric loop closure arrangement to ensure a tight seal. It is especially useful if the floor is uneven. U “universal” type designed for commercial or industrial applications, comprising steel angle. In this instance the customer needs to ensure that the floor is completely flat in order to minimise any smoke leakage. UK “universal with spring” type designed for commercial applications, comprising steel angle with an additional aluminium profile connected to a spring in order to accommodate any unevenness in the soffit when the curtain is rolled up. A side guide system provides a seal between the sides of the curtain fabric and the walls, ensuring that any positive or negative pressures created by a fire will be resisted by the curtain and so that it won’t deflect significantly. Side guides can be integrated either into or onto a wall / soffit or into a recess / niche. The FM-1 side guide roller system has been designed to ensure that the curtain will move to its closed position easily even when there are significant air velocities around the curtain. A FM-1 fire curtain can be made capable of operation as an integrated part of a smoke control and fire management scheme, with emergency power units and the facility to interface directly with a fire alarm system. There are 2 control options. 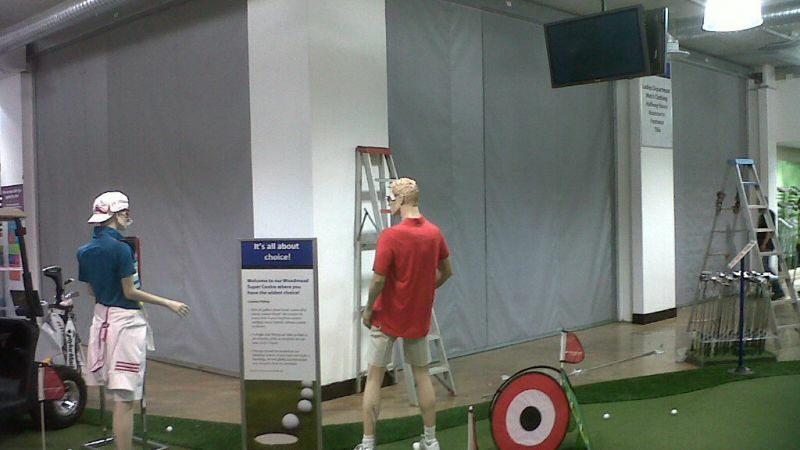 The curtain installation is fully protected and fail-safe to avoid the need for fire rated cabling. The control system maintains the curtains in the raised position in the event of a temporary interruption to the power supply if an optional uninterruptible power supply (UPS) has been supplied and connected. If power is not returned, the curtains will descend to the down / default position for a predetermined period (nominally 30 minutes) in a controlled fashion. If signalled to descend during this period, the curtains drop under the force of gravity in a controlled manner to their fire operational position in a fail-safe manner. Once the curtains have descended, they can then be driven up. The panel also has a switch for service and maintenance purposes, so that the installation can be individually checked without having to interfere with the FAS. Control panel with a fascia-mounted key switch for manual operation of the connected curtain(s). Connections to the central fire alarm system via a voltage free contact. Optional connection of the panel to a battery back-up to retain the curtain in its retracted position for a set period if there is mains failure. Optional voltage free contacts for signalling curtain up/down and for mains voltage failure. The control panel is as described above, but with additional features and functions. It has been tested to BS 8524. It is designed to meet the requirements of the pr12101-9 product standard. It has a local power supply system to maintain all control functions over a period of at least 72 hours, meeting the requirements of EN 12101-10. The panel is modular and can be configured to provide any of the necessary functions needed for a project. It monitors cables for wire-break and short circuit in accordance with EN 12101-9. It can function as a standalone system when connected to smoke/heat detectors and break glass push buttons. It has 3 indication lights and a buzzer and push buttons for manual operation. An emergency opening button for personnel leaving an area to be able to open the curtain once it has descended so that they can escape. A fire-fighter’s override button to raise the curtain in order to allow fire-fighter access to the space on the other side which is on fire. A safety bottom bar to stop the curtain when it is descending if there is an obstruction. A beam detector to monitor the opening for obstructions. Multiple position deployment: this could involve a curtain which would drop part-way, perhaps to provide smoke control in the early stages of the fire, hold at that for a set period and then dropped to provide fire protection at a later stage. Combination multi-tone siren and strobe light including the option of a voice warning system. Electrically operated automatic fire curtain, which seals off an area which is on fire, thereby preventing that fire from spreading from one area to another. The curtain falls under gravity in a controlled manner to a predetermined level in a fire situation or on loss of power. Overall curtain lengths for single units are available from 1000mm to 6000 mm, and drops are available from 500mm to 5000 mm. A requirement above these dimensions will be met by installing either double horizontal or double vertical units. Double vertical and double horizontal units are unlimited in length and drops are available from 500mm to 6000mm. Double vertical (type DV) unit, where continuous runs with overlapped fabric to form a continuous barrier are required. Double horizontal (type DH) unit, where continuous runs with overlapped fabric to form a continuous barrier are required and where there is a premium on space under the ceiling. ID industrial bottom bar, comprising a fabric loop closure arrangement to ensure a tight seal against an uneven floor. U universal bottom bar comprising steel angle. 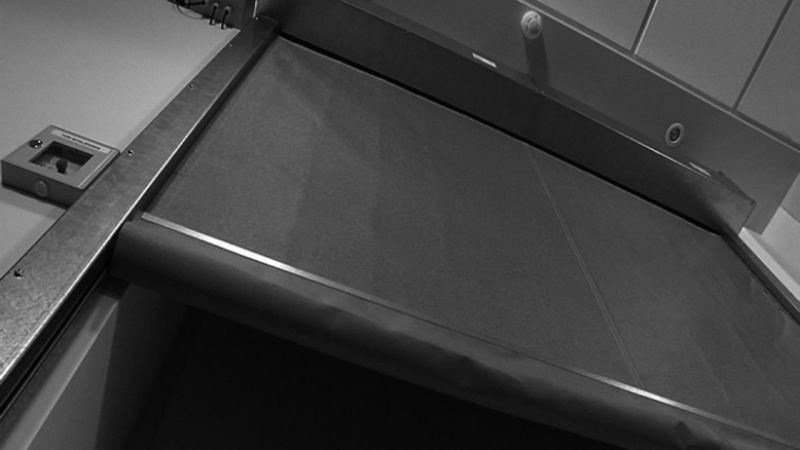 UK universal bottom bar comprising steel angle with an additional aluminium profile connected to a spring in order to accommodate any unevenness in the soffit when the curtain is rolled up. 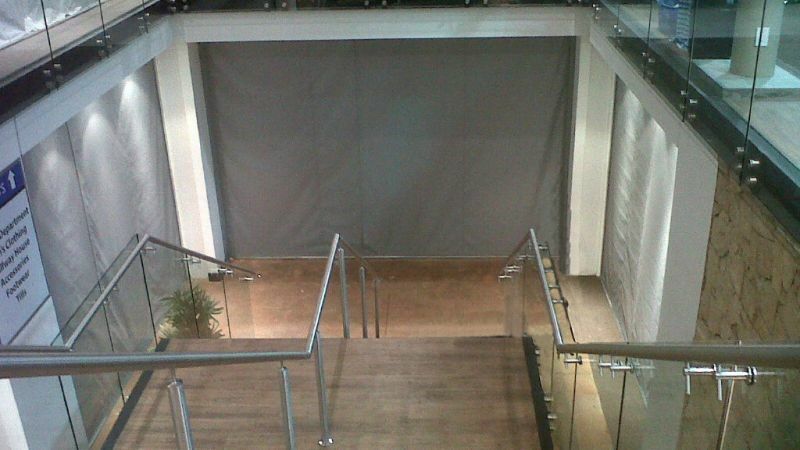 Curtain installation fully protected and fail-safe to avoid the need for fire rated cabling. Curtains maintained in the raised position in the event of a temporary interruption to the power supply if an optional uninterruptible power supply (UPS) has been supplied and connected. If power is not returned, curtains descend to the down / default position for a predetermined period (nominally 30 minutes) in a controlled fashion. Panel has a switch for service and maintenance purposes, so that the installation can be individually checked without having to interfere with the fire alarm system. As above but with additional functions. Control panel tested to BS 8524. Designed to meet the requirements of the pr12101-9 product standard. Has a local power supply system to maintain all control functions over a period of at least 72 hours, meeting the requirements of EN 12101-10. Modular build to accommodate the specific needs of the project. Monitors cables for wire-break and short circuit in accordance with EN 12101-9. Can function as a standalone system when connected to smoke/heat detectors and break glass push buttons. Has 3 indication lights and a buzzer and push buttons for manual operation. Intermediate stop for curtains before they descend completely to the floor. EN 13501-2 "Fire classification of construction products and building elements"
The Colt FM1 Fire Curtain has been tested as a fire barrier in accordance with EN 1634-1 and has a E60-C, E120-C and E180-C rating in accordance with EN 13501-2, thereby achieving an integrity rating for either 60, 120 or 180 minutes. The E 60, E 120 and E 180 fabrics achieve the building class A2 S1 d0 to EN 13501-1. Colt’s E120-C and E180-C fabrics achieve a EW 30 class in accordance with EN 13501-2, which demonstrates that they re-radiate only a limited amount of heat. Successful continuous performance test (10,000 cycles) in accordance with DIN 4102-18.